Mauna Kea is a dormant volcano in the Hawaiian Islands. It is the highest point in Hawaii at 4,205 meters. If measured from top to bottom, below sea level, it is 10,200 meters high and would be the tallest mountain in the world. It is around 1,000,000 years old.[source?] 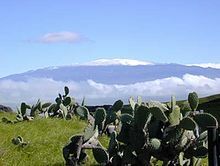 Mauna Kea means 'white mountain' because in winter it often has snow at the summit. Mauna Kea is an important site for astronomy. Many different countries or institutions have an observatory there, including the National Astronomical Observatory of Japan. The W. M. Keck Observatory with its 10-meter mirror is one of the most powerful in the world. Mauna Kea is an important site, especially for infrared astronomy, because of its height and clear skies. High altitude is important because atmosphere causes an effect called seeing, which limits the quality of images by blurring them. At high altitude, there is less atmosphere between the observatories and space and this lessens the effect. ↑ "List of Telescopes on Mauna Kea Website". This page was last changed on 31 March 2017, at 02:02.